Simplify link handling to content, attachments, email or external urls in content types and parts. It also includes a OptionlinkSelector macro. 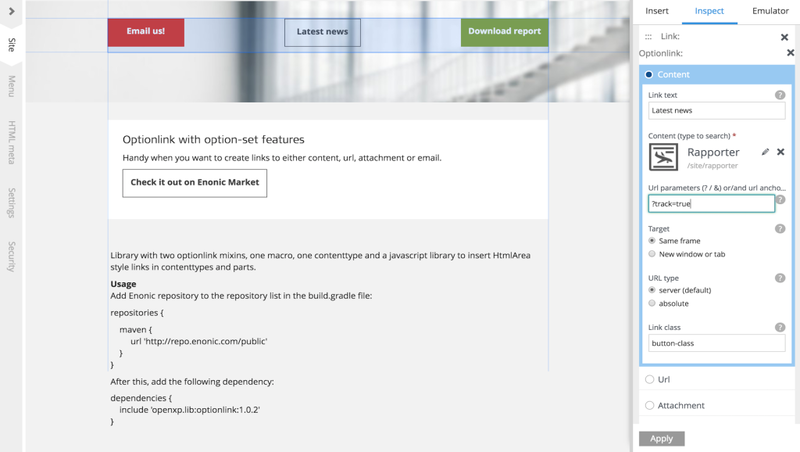 This enables you insert a macro inside a HtmlArea and select a Optionlink contenttype which is rendered by using the included fragment /site/fragments/openxp/optionlink.html. The optionlink text can be overridden for each macro that is inserted. There are two mixins included that can be used in contenttypes to give the editor the option of linking to either content, attachment, email or url. One mixin with a separate input for link text with fallback to using displayName - and one without link text. The latter is useful if you are creating a clickable call-to-action type box without its own link text.